Banking supervision requirements and standards have evolved significantly over the past decade, especially since the global financial crisis of 2008, standards evolved from Basel I to Basel II and now Basel III. It is no longer an option to develop or purchase a fixed Basel I or Basel II or even Basel III platform as it will surely be obsolete within 5 years. Now more than ever financial regulatory organizations need to adopt a robust and flexible platform that evolves right along evolving global banking supervisions standards and guidelines. Banking supervision platforms in the 21st century, need to be easily tweaked/configured to incorporate any new data points, new ratios, and new validation rules. Expertly designed for financial regulatory bodies across the globe, SQL Power offers banking supervision solutions that can be easily tailored for a central bank’s current banking supervision needs while also providing a robust platform that can be easily tweaked in days/weeks in order to adopt the latest banking supervision standards and guidelines as needed and when needed without needing to make any additional software purchases – Thus future-proofing your organization’s banking supervision platform. Our software solutions are architected to integrate easily with existing supervisory software and infrastructure for a seamless transition and on-boarding of all regulated entities. Our solution is dynamic, flexible and scalable and can be easily configured to automate your current banking supervision applications, financial returns, validation rules and KPI(s) - providing in-depth reporting and analytics platform while adding the convenience of e-commerce, electronic signatures and automated Certificate generation. The SQL Power Banking Supervision Solution also comes bundled with integrated Analytics instantly highlighting key ratios and their relative performance on any financial submission. Analysts no longer have to remember or look-up acceptable key risk ratios or an organization’s reported metric in the last reporting period or its relative performance to its peer group. Our banking supervision platform allows each central bank to define their Key Performance Indicators (KPIs) for a regulated bank (these KPI(s) can vary by class), acceptable ranges for each KPI, or acceptable variance year over year. 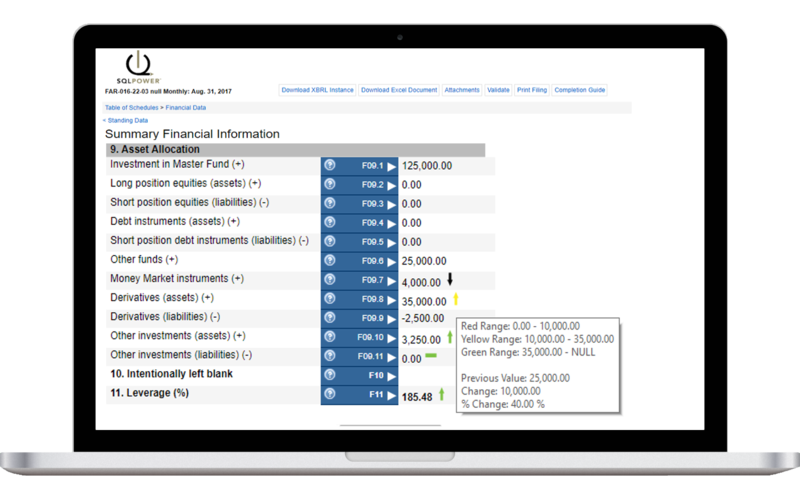 Once the financial returns are submitted, the system immediately highlights and colour codes (red, yellow or green) each submitted key metric, providing a colour-coded up or down arrow, while also allowing the analyst to hover over the submitted metric to view a pop up of a trending graph and a year-over-year performance comparison chart). Increased Automation, Improved Efficiencies while Future-Proof your Banking Supervision platform! SQL Power uses a powerful and robust data collection and analytics platform to automate the core banking processes for licensing and financial data collection, management and processing, paving the way for more efficient use of operational budgets and personnel resources. Through a fusion of pre-built Basel I, II, III on-line forms, customized workflows, electronic signature, payment collection and integrated analytics functions, SQL Power immensely reduces all the manual work typically associated with bank licensing and banking supervision processes. 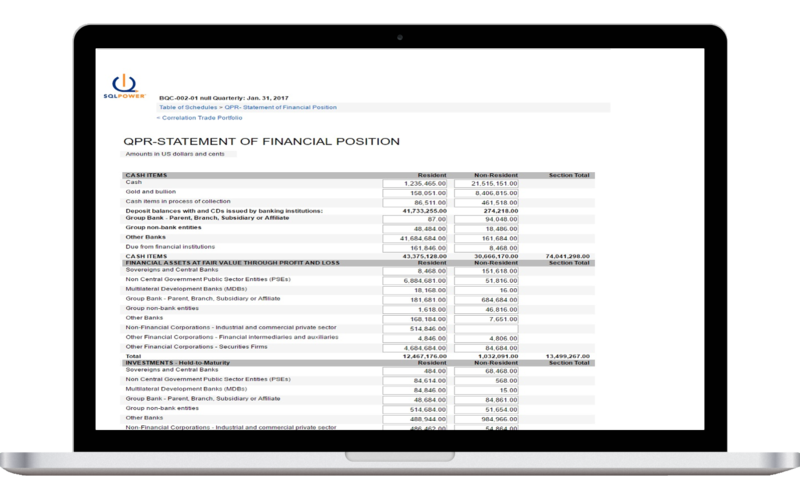 No more eye-balling of financial returns or manually looking-up key risk ratios or year-over-year performance of a bank or its peer group; In seconds the system will highlight problematic financial submissions amongst the see of green (acceptable) submissions, allowing the analysts to focus on the problematic returns. Once the problematic financial return/submission is opened each key metric is colour-coded and any violated risk ratios are instantly highlighted significantly cutting down on the manual review process and the banking division’s workload. The system can also be configured to automatically trigger on-site inspections based on the violation of those key risk-ratios. On-site inspection projects can be automatically triggered or manually launched by the banking inspection division and an on-site inspection project plan can be automatically created based on pre-defined on-site inspection templates: communications are automatically sent, meetings scheduled, as well as the scheduling pre-site visit inspection form. Other on-line forms can also be requested, fines can be levied and collected all within our on-site inspection module. SQL Power’s banking supervision solution is designed to easily integrate with existing core CRM and governance systems, leveraging existing data and technology investment for a seamless integration. Our platform can be configured to easily evolve with global banking supervision standards and guidelines thus future-proofing your organization. Finally, our experienced team of engineers works within your business scale to ensure that our software implementation is smooth and functionally sound. If your organization could benefit from SQL Power’s advanced banking supervision solutions, we’d love to hear from you!